A mid-week holiday isn’t stopping many residents from getting out there and taking a holiday vacation. According to officials with AAA, more than 42 million people are expected to travel more than 50 miles from their home to celebrate this year’s Fourth of July holiday. That’s a near 5 percent increase in travel compared to just a year ago. A good majority of these travelers will be behind the wheel too, severely increasing all of our risks for a car accidents in Boston and throughout New England. Officials estimate that nearly 43 million will be hopping in a car for this year’s vacation. Why? Many believe that it’s the low gas prices that are fueling everyone’s vacation spirit. Our Boston car accident lawyers understand that this year’s travel predictions are the highest since 2007. Experts believe that by having the holiday land on a Wednesday more people will opt to make it a really long weekend. In fact, most people are expected to start their vacations before the work week even begins. Most of these people are expected to hit the road too, as officials are estimating that nearly 36 million will be using a motor vehicle to get to their vacation destination. According to officials with AAA, June 29, a Friday, will be the single biggest day with the most expected travel before July 4. Just last week, gas prices were averaged at under $3.44 a gallon in the state of Massachusetts. That’s about 50 cents lower than the prices were during this time of the year in 2011, according to The Boston Globe. The travel in the New England area is expected to outpace travel levels nationwide. In our area, more than 1.7 million residents are expected to take the holiday to get out and vacation. “The landscape of the US economy is in a much different place…encouraging to see such growth this summer as Americans take to the road to visit family, friends, and great vacation destinations,” said Lloyd P. Albert with AAA Southern New England. 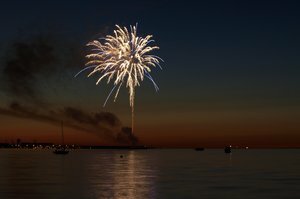 The National Safety Council (NSC) is estimating that nearly 175 people will be killed over this year’s Fourth of July holiday, counting as the evening of July 3rd through the evening of the 4th. Another 17,000 people are expected to be injured in these same accidents. For this reason, we’re asking all drivers to head out with safety as a top priority. Make sure that you leave with plenty of time to reach your destination, keep distractions out of the driver’s seat and obey by all road laws. Make sure you check out your car, too. Take a peek at the fluid levels and at the condition and air pressure of your tires. Safe driving habits are your key to staying safe behind the wheel during this year’s holiday. Happy Fourth of July! If you or someone you love has been injured or killed in an accident in Boston or elsewhere surrounding areas, contact Boston Injury Lawyers Jeffrey S. Glassman. Our law firm offers free and confidential appointments to discuss the cases and the rights of victims. Call 877-617-5333 to schedule your free appointment.